Cornish Sea Salt was the brain-child of Tony Fraser who, after moving to Cornwall in 2004, was looking for a new business idea. Based in Cornwall, The Brownie Baker can send that chocolate magic anywhere by mail order. The Cornish Barkery produces delicious and nutritious gourmet treats for your beloved dog. Our Highland matriarch conservation grazing above Portheras Cove at Chypraze. Ian and Mervyn took over grandmother’s farm, Chypraze, in 2009 realising that its former business as a small dairy farm was no longer viable. Exquisite Cottage Creations is based in a picturesque granite cottage in the Cornish countryside, and offers a large selection of gifts inspired by rural country charm. Vicarage Farm is owned by Kim Courtauld, who studied at agricultural college in Scotland and worked in rural areas across the UK as a farmer and gamekeeper. Pura Pressed is part of a new breed of convenience food and drink, offering true transparency of its products made with natural ingredients. Nothing added, nothing removed! The range includes cold pressed juices, smoothies and soups (seasonal). Dal Hall was inspired to make raw chocolate because he loved the taste, the smell and the way it makes you feel, but lamented the fact that mass produced chocolate no longer retained the health benefits of cocoa. 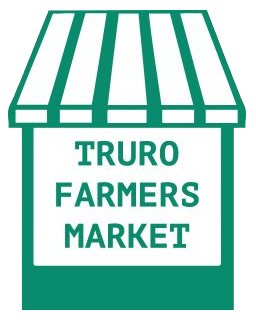 The white and green striped stalls of Truro Farmers Market remain at the vibrant heart of Cornwall’s culinary scene. Copyright © 2019 Truro Farmers Market. Powered by WordPress. Theme: Spacious by ThemeGrill.